About Samsung | Stop Samsung - No More Deaths! What’s wrong in SAMSUNG Semiconductors? What’s wrong in the global electronics industry? What’s wrong with the SAMSUNG ‘no-union’ policy? Stop Samsung – No More Deaths! Recently SHARPs was able to get some information of several cancer victims of different companies from Samsung. One of them is Kim Jin-ki, 38 year-old male worker of Magna-chip semiconductor in Cheongjoo City, which used to be a part of Hynix Semiconductor. The press conference in front of KCOMWEL Cheongjoo office on Sep 8. The woman in center is Yim Jinsook, the wife of Kim, with the picture of Kim. He used to work for 14 years as a maintenance engineer of an ion implanter (the facility for implantation of ion as Arsenic or Phosphorus into the silicon wafer), being exposed to various chemicals and radiation. He got leukemia last year, and several years before he got a thyroid disease too. He died on May 28, due to the graft-versus-host-reaction after a bone marrow transplantation. He had been healthy before he got the diseases from his workplace. There is no familial history of cancer in his parents and his two brothers. SHARPs with some local activists and a labor attorney prepared his application for workers’ compensation. We made a press conference together on September 8, when his wife applied for compensation to the government. The second victim we discovered was from the medium-sized company, Kijoo industrial Co. in Incheon City, one of the suppliers of LG and Samsung, manufacturing PCB for those big companies. 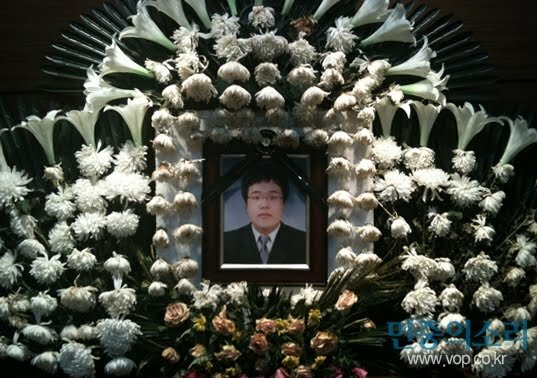 The victim’s name is Park Sung Chul, born in 1977 in China. His family used to be the “Chosun-jok”, the Korean people in China, and he recently came back to Korea and got the new nationality as a South Korean. But he and all his family have been living as ‘migrant’ workers. That’s why Park who had graduated university of economics had to work as a blue collar worker, in the cleansing and plating process using various chemicals. After three years of work, he got leukemia. The heart-breaking story is he had given up further treatment after three times of chemotherapy. He had been recommended bone marrow transplantation, but he refused all kinds of therapy… due to the lack of money… The family of migrant workers was too poor to support all the treatment. So he had been lying in his home under his old mother’s care, and died on September 22. His uncle had tried to find out someone who can help them for workers’ compensation, and through a local NGO he could meet the Korean Metal Workers Union. On August 10, Korean Metal Workers Union put in a collective compensation application of many cancer victims including Park. His cancer and death show all the typical problems in workers’ claiming their right to safety and health. The poster for the website of Bahn-dahl 2011. You can see the faces doing 'Ho~' on the left. SHARPs has been making a concentrated series of public activities under that name every year, at the end of July. In the Korean language, the abbreviation of that name is “Bahn-Dahl” which has the same pronunciation as “half-moon”. So the symbol of these actions is the half-moon. This year, we’ve changed the Bahn-Dahl into six weeks of action, under the slogan of “Ho~”. The “Ho~” means the motion of blowing a breath, usually to cool down hot food for child or to reduce pain of a wound. It can be used when people try to comfort pain of others, both physically and mentally. This slogan was made for waking up the heart of solidarity that people have within themselves, and for making a space for us to tell them what is the real pain of the victims and what must be done to relieve it. 2. to disclose all the information. Especially, the government agencies like OSHRI in KOSHA must reveal their research results according to the law on public organizations’ disclosuree of information. Also we are demanding the right to participate in the relevant research. 3. and to take the responsibility on the part of the government and the company. Especially, the government must make to improve the working environment to guarantee workers’ safety and health, covering all the electronic sector. Bahn-Dahl was begun on September 21 in Suwon city where the major Samsung semiconductor factories are located. Off-line activities of Bahn-Dahl is mainly a candle-light rally once a week with some cultural performances like songs, dances, and short movies, at Busan, Suwon, Seoul, Cheonan, and Cheongju cities. On-line activities include internet petition-signing to a demand letter, which will go on till October and finally be made into a formal protest letter to the government and Samsung. The first group of five leukemia and lymphoma victims have filed the lawsuit against government’s refusal to compensate; all the cases went to the high court on July 14, and now are in the course of preparing documents. 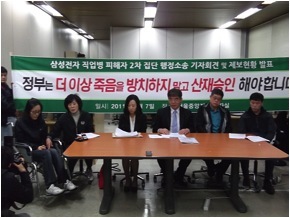 The second group of victims in the lawsuit is composed of four victims with different diseases like brain tumor (Han Hyekyoung, Samsung LCD), aplastic anemia (You Myoungwha, Samsung semiconductor), multiple sclerosis (Lee Heejin, Samsung semiconductor), and malignant brain cancer (Lee Yoonjeong, Samsung semiconductor); they are each in the course of court processes. Two of them, You Myoungwha and Lee Yoonjeong, are from the same department of Burn-in test in Samsung semiconductor factory at Onyang City. The press conference of second group lawsuit is at the Seoul administrative court. (from the left) Han Hyekyoung (brain tumor, Samsung LCD), her mother, two lawyers, You Youngjong, the father of You Myounghwa (aplastic anemia, Samsung semiconductor), Jeong Heesoo, the husband of Lee Yoonjeong (brain cancer, Samsung semiconductor). At present, SHARPs has gathered the information of about 150 victims, among which there are around 50 deaths. The exact number needs to be calculated and updated again. The number who have applied for national workers’ compensation through SHARPs is 21, including one Magna-chip worker. Of these 21 cases, 18 of them have been decided by KCOMWEL to NOT be compensated, and others are still in the process of decision. Lee Yoon-jeong, who had been diagnosed with malignant brain cancer in 2010 and been sentenced to be able to live only one year by the doctor, fell again recently. Her cancer couldn’t be removed fully. She gets chemotherapy again now, but the prognosis doesn’t seem to be good. We are praying for her survival with the least suffering. Her age is 31 now. Han Haekyoung, the severely disabled women after removal of a huge tumor from her cerebellum since 2005, has been hospitalized in ‘Green Hospital’ for free to get rehabilitation treatment. However she and her mother have been suffering from poverty because none of them can work for money. SHARPs has been supporting the least money for their life every month for more than two years, by collecting money from many nameless contributors. As the number of victims becomes bigger, the types and depth of pain of them which must be shared by the whole society become more serious. Many of the victims and their families need either economical or psychological support, or both. In a blow to Samsung Electronics, a court ruled yesterday that the deaths of two employees at Samsung’s semiconductor plant should be considered an industrial accident and that Samsung should compensate their families accordingly. The two workers died of leukemia, and their families filed for industrial accident compensation with Korean Workers’ Compensation and Welfare (KWCW) three years ago, claiming their illness had been caused by exposure to harmful elements at the plant. But KWCW refused the claim, saying it saw no direct link between leukemia and the semiconductor plant. That prompted the families to file a lawsuit in January of last year. The court added that research by the Korea Occupational Safety and Health Agency proves that workers at chip facilities have higher risk of cancers of the lymphatic system and leukemia, which shows environmental factors had an effect on their diseases. But the court did not acknowledge such a link for two other workers and a family member of a late worker, citing a lack of evidence. Samsung said it plans to appeal. A Samsung official told Yonhap, “The ruling goes against the results of investigations by a state-approved organization on semiconductor plants’ occupational environment,” adding that it will soon have results from another independent study. The civic group Banollim, formed to protect rights of semiconductor workers, claims 20 workers at the plant suffered from leukemia or cancer, with nine deaths since 1998. Samsung maintains that there are no such risks at its plant, citing an investigation by the Korea Occupational Safety and Health Agency in 2007 and 2008, which concluded it’s unlikely that the plant caused the diseases. In June, Samsung said that it commissioned an independent, yearlong safety study to examine health risks at its semiconductor plant, which will be led by Environ, an environment and health consultancy, and carried out with input from some 20 academic experts. Ninety-seven days. The chrysanthemums were a faint yellow with their heads dropped limply. The season changed from bitter cold to spring landscapes. At the viewing room for a young man who wilted away like the flowers, there was merely candlelight. At the viewing room in Soonchunhyang University Cheonan Hospital in South Chungcheong Province early Sunday morning, family members of the late Kim Ju-hyeon were just packing up their things. Kim, an employee at the Tangjeong factory of Samsung Electronics in Asan, South Chungcheong Province, took his own life on Jan. 11 by jumping from the thirteenth floor of his dormitory. His suicide came 373 days after he joined the company with the congratulations of his family. Contending that Kim took his own life due to depression from excessive working hours and stress, the family members demanded an apology from the company and measures to prevent similar incidents from happening in the future. They also claim that the company ignored no fewer than four previous suicide attempts by Kim without taking any appropriate measures on the morning of the incident. The record of the emergency care center at Soonchunhyung University Cheonan Hospital, which examined Kim’s body on the day of his death, includes phrases about “depression” and “references to suicide.” Samsung has refused to acknowledge this evidence that it knew about Kim’s suicide attempts. Kim Myeong-bok and Samsung Electronics representatives signed an agreement on Apr. 15 that included a company apology and pledge to prevent similar incidents from occurring. “I had no idea it would be so hard getting this single sheet of paper,” Kim said. On the same day, the bereaved family members withdrew a January petition to the Cheonan branch of the Ministry of Employment of Labor asking for special labor oversight at Samsung Electronics, which the company demanded as part of its terms for signing the agreement. Kim’s family members paid a visit Sunday to the dormitory where he had lived, but were unable to stay for even ten minutes due to control measures from the company. 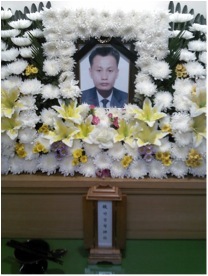 Following Kim’s cremation at Cheonan Memorial Park, the family plans to keep the container with his ashes at their home in Incheon for the time being. “We will monitor to see whether the measures to prevent reoccurrence are properly implemented,” said Lee Jong-ran, a labor attorney with Banollim, a human rights and health watchdog for semiconductor workers. 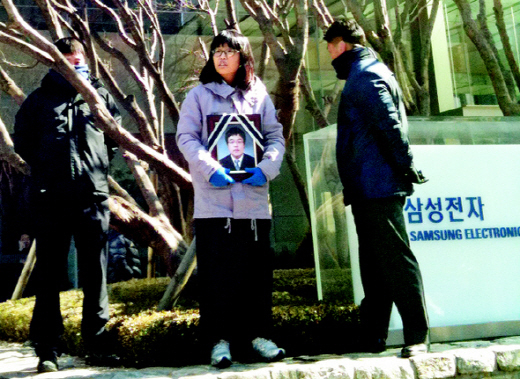 As workers streamed out of the building for lunch at noon on Thursday, three women stood in front of the head office of Samsung Electronics in Seoul’s Seocho neighborhood holding a funeral portrait and wailing. The women are the mother, older sister, and aunt of Kim Ju-hyeon, a worker at the company’s Tangjeong LCD complex who committed suicide in his dormitory on Jan. 11. Kim was 25. Samsung positioned employees to physically prevent Kim’s family members from entering the building. The same scene has been repeated for a full week, with dozens of men positioned at the entrance to the main building to block the bereaved family members. This decision has been called unprecedented even by those within MOEL. “In my eight years as a labor attorney, I have never seen the Ministry of Employment and Labor refuse to disclose a company’s employment regulations,” said Lee Jeong-ran, a labor attorney with the group Banollim, a civic organization that advocates for the health and human rights of workers in the semiconductor industry. “The decision not to disclose the regulations is evidence that the Ministry of Employment and Labor is assigning itself the role of Samsung’s puppet,” Lee added. Kim, who began work as an equipment engineer on Samsung Electronics’ LCD color filter production line in January 2010, jumped to his death from the 13th floor of his dormitory. He had been suffering from stress due to workdays lasting over 12 hours, as well as a skin disease of unknown cause. Fifty days after his death, no funeral has yet been held. Banollim and other groups that have battled Samsung Electronics over occupational leukemia cases designated the third week of March as “memorial week for workers who have died from semiconductor and electronics industry accidents.” They plan to hold rallies during the week at sites such as Seoul Station and the area near the main offices of Samsung. Despite New Year holidays (Feb. 2 to 6) in lunar calendar in Korea, there are people who cannot enjoy them. The bereaved family members of the deceased Mr. Kim, Joo-Hyun, a worker in the Samsung Electronics LCD, City of Cheonan are part of those. 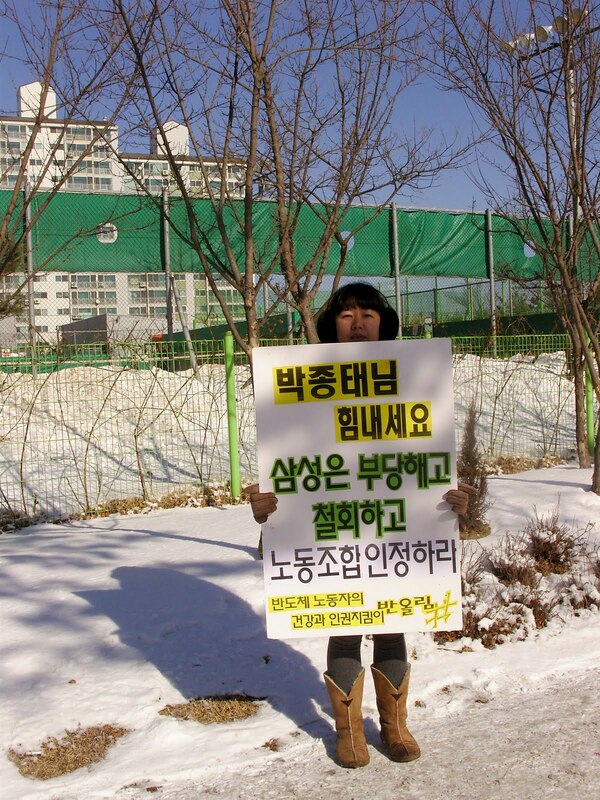 Even though, it was Jan. 11 when Mr. Kim Joo Hyun made suicide by jumping from the rooftop of the factory dormitory, his family members are still keeping mortuary where his portrait is still being placed on, demanding acknowledgement and apology from Samsung for the cause of Kim’s death. The investigation on the cause of his death, such as excessive working time and on company’s negligence on his suicide has been still going on as well, the Voice of People reports. For Samsung workers’ occupational death and protests, see HERE and HERE as well. Samsung is not only infamous for its no-labor union policy but also for its omnipotent abuse of power throughout South Korea. The Republic of Korea is called as the Samsung Republic in satire. Samsung is also involving in Korea Aerospace industries along with Hyundae (The current president Lee Myung-Bak is originally from Hyundae) and Daewoo etc., producing and exporting many weapon systems, for example its branch, Samsung Tales leading maker and exporter of naval combat systems. It has been alarming when the Jeju media (Jeju Sori1, Jeju Sori 2, Media Jeju) reported that the Jeju Island government had made contract for partnership with Samsung C & T to achieve export of 1trillion won on Jan. 21, 2011. It reported that the Jeju Island and Samsung made contact to collaborate on scouting for bright export goods, supporting for foreign marketing and inheriting on export know-how for the Jeju Island government officers. Further, the Samsung C & T has made contract with the navy for the naval base construction along with Daerim who is involving the construction on space museum thorough its consortium. The Samsung C & T is also being involved in KEPCO (Korea Electric Power Corporation) consortium along with the KEPCO, Hyundae and Doosan Industry, which has made contract with the United Arab Emirates on nuclear power plant in Dec. , 2009. Jan. 21 was the next day when the Jeju media reported the contradictory decision by the members of the special committee on the settlement of the conflict on naval base, Island Council, who were told to decide to urge the prime minister for earlier legislation on the revised bill on the Jeju special law which included the support basis on the Jeju naval base, while 40% of the members had voiced on the unjust process on the annulment of the absolute preservation areas in the Gangjeong village. The Samsung, supporting the drive by the central and Jeju Island government, Jeju Island Council for Jeju being one of the seven wonders of nature, is grasping the Jeju Island, as it has wielded power throughout South Korea. Please watch Samsung. Please boycott Samsung product in your countries and if you can, protest on its oppression of workers and involvement in the Jeju naval base construction. 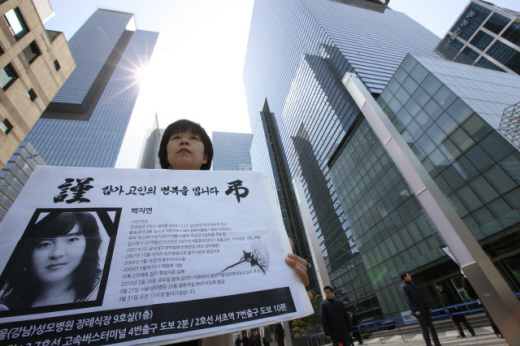 A civic organization member in support of the human rights of workers in the semiconductor industry holds a signboard during a one-person demonstration mourning the death Park Ji-hyeon, a Samsung Electronics employee who passed away due to complications from leukemia, in front of the Samsung Headquarters in Seoul‘s Seocho neighborhood, April 2. A number of people have come forward and claimed that Samsung Electronics has offered large settlements to employees and their families in order to persuade them to drop industrial accident claims. Employees filed the claims after contracting diseases such as leukemia while working in the company’s semiconductor and liquid crystal display (LCD) plants. Surviving family members of employees who have already died from diseases, as well as employees currently suffering from disease and their family members, have claimed that Samsung has offered hundreds of millions of won in settlements in order to persuade them to drop their industrial accident claims and terminate contact with civic organizations. According to accounts from her family members, Samsung Electronics secretly proposed the settlement to them just before Park passed away. Her case was in the middle of administrative litigation after the Korea Workers’ Compensation & Welfare Service (KComWel) ruled in 2009 that it would not recognize the case as an industrial accident. More accounts have surfaced to indicate that Samsung Electronics has persuaded not only Park’s family, but also other sick employees and family members of deceased employees to drop industrial accident claims. This fact was attested to in detail by the family members of Han Hye-kyeong, a 31-year-old Samsung Electronics LCD plant employee suffering from a brain tumor, and Yeon Jae-wook, a Samsung Electronics LCD plant employee who passed away in 2009 from a mediastinal tumor. Kim Si-nyeo, the 54-year-old mother of Han Hye-kyeong, received a similar offer in early June. She was called up with settlement offers by a Samsung Electronics higher-up and an ordinary employee whose names she does not recall. Kim currently endures very difficult living conditions, having moved not long ago from a 17 million Won deposit rental unit to a 5 million Won monthly rental unit in order to arrange the money for her daughter to receive treatment in her battle with a brain tumor. She also sold off the small restaurant she previously ran. Now she has no income. The settlement offer from Samsung was very tempting, but Kim turned it down. “Samsung became a social problem, leaving my daughter exposed to that dangerous work environment, and its improper practice of trying to cover that up with money needs to be fixed,” she said. “Samsung is lying,” she repeated. Kim Ki-young, a former Samsung Electronics section chief who retired in early May after contracting Wegener’s granulomatosis, a rare disease, after working for around a decade as an engineer at the company, met on April 1 with a company official and a section chief identified by the surname Lee. Kim asked Lee, who was visiting him at his home in Yongin, Gyeonggi Province, to cooperate in his industrial accident claim. The response, however, was not favorable. Kim Eun-gi, head of the KCTU labor safety bureau, said that having Park Ji-yeon’s administrative suit dropped was part of a carefully plotted strategy by Samsung Electronics. According to Kim, Park’s case had the highest odds of victory among the six employees who had received industrial accident non-recognition judgments in May 2009. “Samsung probably took into account the effect it would have on the industrial accident claims of the other workers if Ms. Park’s case was recognized as an industrial accident,” Kim said. The Samsung Electronics semiconductor production line, which has been the subject of controversy due to a series of health complications including leukemia cases among its employees, will undergo a workplace environment investigation starting in mid-July. However, plans for participation by civic organizations like Banollim that have called on Samsung to take responsibility for the leukemia cases, as well as bereaved families of Samsung employees who died from the disease, failed to come to investigation. Samsung Electronics announced plans Thursday to form an investigation team made up of some 20 industrial health researchers from South Korea and abroad and carry out a yearlong investigation of the semiconductor production line work environment beginning in mid-July. Samsung has been swept up in a firestorm of controversy over workplace environment hazards as some twenty employees who worked on the line over the past decade or so have developed leukemia or lymphoma. Ten of these employees subsequently died, according to Samsung Electronics. The study is being led by Environ, an environmental health consultancy headquartered in Washington, D.C. Established in 1982, the company is considered an authority in chemical hazard assessment and environment hazard management, Samsung Electronics stated. Also participating in the study are researchers from U.S. public health graduate schools at Harvard University, the University of Michigan, and Johns Hopkins University, as well as researchers from the Korea Institute of Science and Technology. Samsung Electronics said that it plans to examine the entire semiconductor manufacturing process to determine the presence of workplace environment hazards and carcinogenic materials, and to investigate the possibility of future illnesses. “The study will also examine connections between the exposure to harmful materials on the production line and the duties of the people who became ill,” the company said. Meanwhile, bereaved family members of deceased Samsung employees and groups such as Banollim that have made allegations about Samsung’s responsibility for the leukemia cases decided not to take part in the examination. In April, Samsung Electronics said that if Banollim were to nominate a trustworthy organization, it would consider plans for including it on the investigation team. The group leveled allegations earlier this month that Samsung Electronics has been persuading the family members of victims to drop their industrial accident lawsuits by offering them considerable sums of money.